Best Grills for Small Spaces: Inside, Outside, Anywhere! Grilling in tight spaces can get frustrating to say the least. You barely have any room to flip your burgers, you feel restricted, and it’s just not the best position to be in. That’s why you’re here. You need the best grills for small spaces, so you can have some room to breathe in your grilling area. Whether it’s indoors or outdoors, don’t let your small grilling space ruin your cooking experience. The 5 grills on this list are great no matter where they are placed, inside or outside. The best grills to use in small spaces don’t necessarily have to be “portable”, but just something that won’t take up too much room within a relatively small cooking area. Whether you live in a small apartment building, have a small backyard, or are grilling on a tight balcony, you deserve to enjoy the nice weather by cooking hot dogs, burgers, and more on your grill. By finding the best grill for small spaces, you’ll be able to finally enjoy these foods without feeling suffocated by the grill and other random items around you. Regardless of how big or small your grilling space is, the Weber Q1400 electric grill will have your back. The 189-square inch cooking area is heated by 1560-watts of electricity, which will be sure to cook your food thoroughly. There is a 6-foot grounded cord to connect to the nearest power outlet, keeping consistent electricity running through the entire unit. The only people who would truly have an issue with this grill are those who do all their grilling outside. While the Q1400 isn’t strictly an indoor grill, not every outdoor grilling space has a power outlet nearby. Don’t like wasting time building stuff? Don’t worry, this compact grill comes fully assembled right out of the box. it also easy to clean and features a unique design. From the durable stainless-steel finish to the adjustable legs, the Smoke Hollow 205 will be a great asset no matter where you are. With this grill, you’ll have more than enough room to cook. This grill has about 305-square inches of cooking space available, which is great for average sized groups. It also features a 10,000-BTU stainless-steel burner that will keep the grill hot for extended periods of time. The stainless-steel exterior will deter any form of rust or corrosion from damaging the grill unit. This grill is also very portable, so wherever you decide to take it, there shouldn’t be an issue finding a good place to begin cooking. The folding legs on this grill also make it great for transporting and storage; saving more space for when you’re not cooking. There are two latches on the front of the grill. This means you can easily take the grill from one place to another without ashes or food particles falling out. Now you can lock the latches and ensure that nothing will leak! Here’s a charcoal grill that can fit almost anywhere and will give your food a one of a kind taste. This grill can be used anywhere: camping, hanging out in the backyard, or at a tailgating party. The glass reinforced handle will give you the ability to lift and close the lid without burning your hand due to the high amount of heat coming from the grill. With a 14-½-inch diameter cooking grate, there will be plenty of room to cook. With this measurement, you can cook for an average sized family; approximately six burgers at once to be exact. 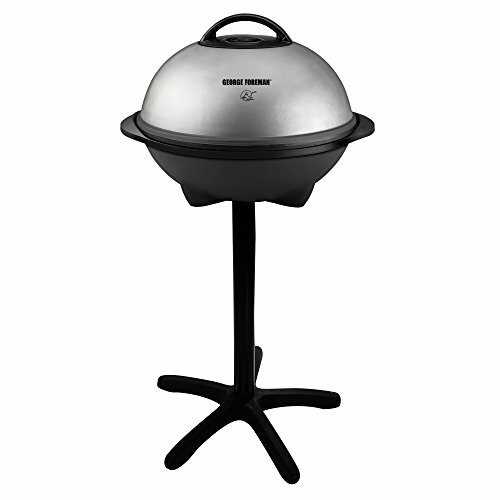 An appealing feature of the Weber 10020 Smokey Joe grill is the 10-year warranty. If the grill rusts or becomes damaged due to regular use, you can get a replacement. Though, rusting will be almost impossible thanks to the porcelain enameled coating, which will also make cleaning much easier. Whether it’s on your apartment balcony, in your backyard, or in a tiny corner of the park, the Smokey Joe will be able to cook for a handful in a small space while giving off that char taste. Here’s a grill from the well-known Cuisinart brand that will be able to hold up in any type of environment. You can purchase this grill as a tabletop grill or with the stand. The stand version is ideal for outdoor cooking. The CGG-180T has a 145-square inch surface that can serve up to 6 people at once, so if you have a handful of people to cook for, it will come in handy. The 5,500-BTU stainless-steel burner will help cook your food evenly and quickly. 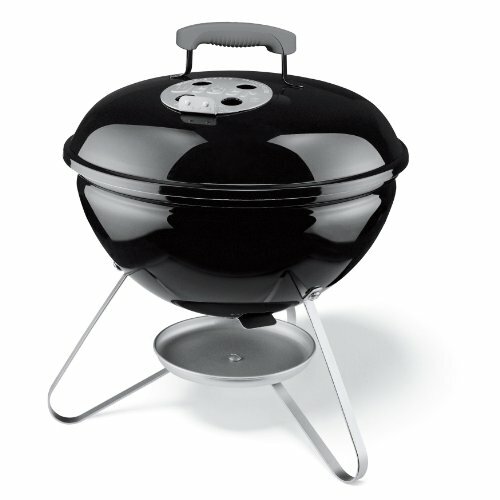 The reason this grill will hold up in small spaces is because it has a compact design yet can cook for a lot of people. The briefcase style design will let you take the grill anywhere and it will fit in smaller areas. It also has an integrated lid lock that will keep the grill closed. The only issue with this grill is that it sometimes has problems with the ignition, which seems to be a frequent problem for gas grills. If the ignition doesn't start the grill immediately, you can try hitting the ignition a few times – which will usually get the grill started. 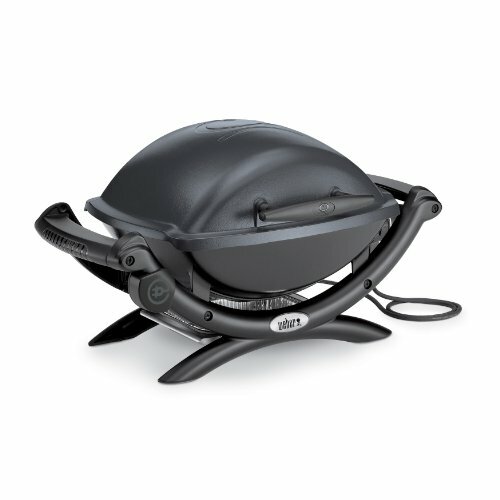 The #5 grill on this list is the George Foreman Indoor/Outdoor grill. Besides its versatility, this grill is great in small spaces because it is narrow and can be reduced to a tabletop grill if need be. With the removable stand, you can have it inside or outside, but either way you’ll be able to grill as much food as you would like. The George Tough Nonstick Coating will separate grease and other materials from the surface of the grill, so all you’ll have to do is wipe it down with a slightly damp cloth. In addition to easy cleaning, this non-stick coating eliminates the need for cooking oil, so all you’ll have to do is place the meat on the grill after seasoning it. If you’re having a big party in a small space, this is the grill to have. The George Foreman GGR50B can cook up to 15 servings at once; plenty of food to go around…a few times. This grill has a 240-square inches grilling surface that can evenly cook all the food you would like. With this grill, you can choose from 5 heat settings, so you can control the temperature throughout the cooking cycle. 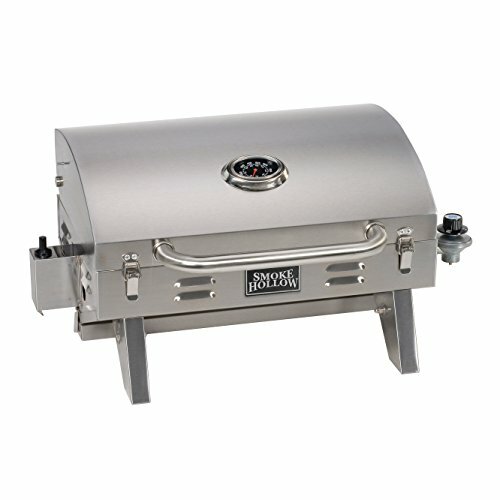 What do you need to look for if you want to find a reliable grill for small spaces? Let’s start with the obvious. The grill needs to be a relatively small size. 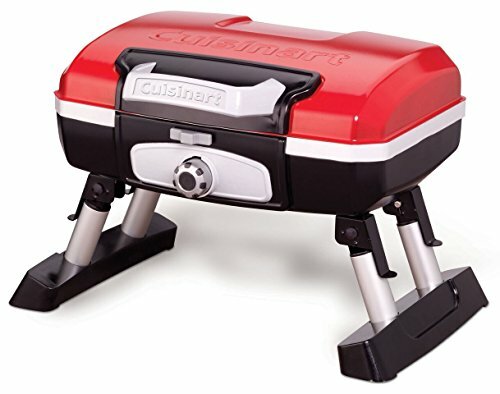 The Smoke Hollow 205 and the Cuisinart CGG-180T are the smallest grills on the list and can be used just about anywhere that propane gas use is allowed. Next, you need to figure out where you plan to use the grill. If you plan on using the grill indoors, then gas and charcoal grills are out of the question. If you are the type of person who enjoys the outdoors and would rather cook outside, electric grills wouldn’t be ideal but they will give you the freedom to use inside and out, like the George Foreman grill at #5. When it comes to the cost of the grill, the Weber 10020 Smokey Joe 14-inch grill has the lowest price, but brings an equal amount of value. You can easily find this grill for under $50, yet it will cook your food to perfection while giving it that outdoor char taste that all grilling fans love. All you need to start cooking is a bag of charcoal, possibly some lighter fluid and a lighter. Whether you have a small backyard or live in an apartment building with a lot of people, it isn’t easy to grill in small spaces…but it is possible. More likely than not, you’ll find portable grills as the best bet for use in small spaces, although there are select stationary grills that could possibly take up the least amount of space when you’re in a tight area. “Small spaces” can be anywhere: outside or inside. Grills for small spaces come with various types of fuel sources; primarily gas, charcoal, and electric. You won’t be able to use gas or charcoal grills indoors, but these grills are your best bet if you decide to stay outside. This is possibly the hardest part when making a final decision, and another reason why versatile grills such as the George Foreman indoor/outdoor electric grill exists. Electric grills are fine, but you shouldn’t expect to get the same type of taste that you would if you used a charcoal grill. To fix this problem, there are several types of seasonings that can be applied to your meat for a better overall taste. Depending on how small the area you are grilling in is, you can prepare the meat elsewhere before applying it to the grill. Or if you have the Weber Q1400 grill, you use the shelves on the side to prepare your food the right way, regardless of how small the space is. What’s the downside to using grills for small spaces? I’d say lack of stability and room to move around. When in a small area, it isn’t as easy to move around, have a drink, and prep your food. Whether you’re in the back of a small SUV, in the backyard, or in the kitchen, it is important to enjoy grilling your food. Just because you are in a small area doesn’t mean you have to give up altogether. These five grills each have features that will makes things easier when you’re stuck in an uncomfortably small space. No matter what heating source they use, how much they weigh, or what they’re made of, these grills can get the job done in the smallest of areas, saving the day for everyone at the cookout! You are here: Home / Outdoor Cooking / Best Grills for Small Spaces: Inside, Outside, Anywhere!